Euler’s Tonnetz organizes the notes into a matrix, instead of a scale. Moving down and to the left represents motion by an interval of a fifth (V) in musical space. Down and to the right shows movement by a major third (III). The lattice has been rediscovered and redrawn many times over the years. 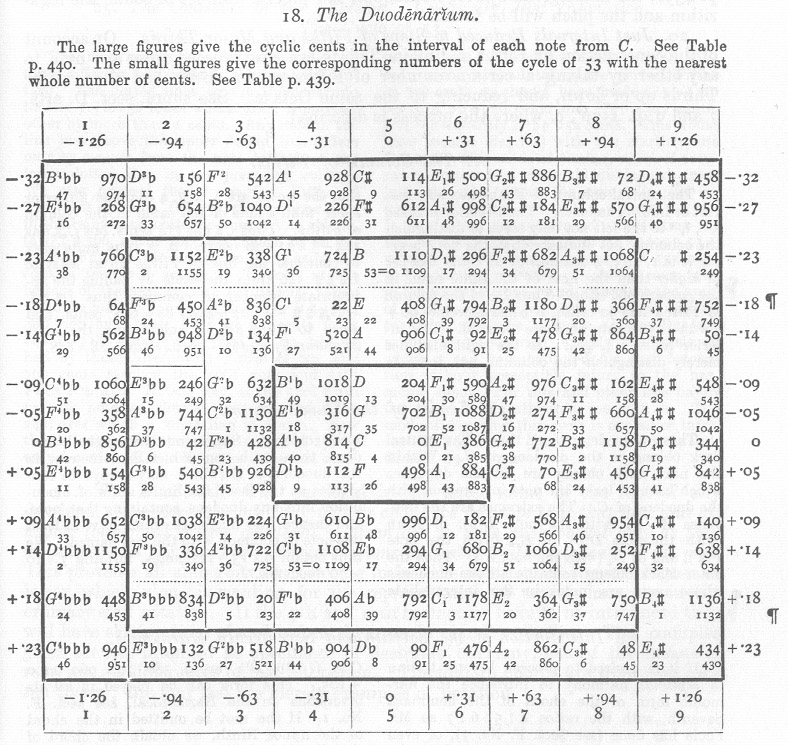 One of my favorites is the Duodenarium of Alexander Ellis, which showed up in his appendix to Helmholtz’s pioneering book, On the Sensations of Tone, in the late 1800’s. Now we’re talkin’! C is at the center. 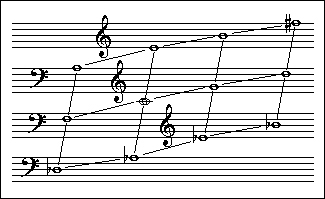 The fifths go up and down, and thirds from left to right, leading to a square grid. Seriously, if this blog interests you, please get a copy of this book. I have no stake in you doing this, except that I believe the more broadly understood this man’s work is, the more great music will be made. I’ve been messing around with the lattice for a year and a half now, and I’ve morphed it into a form that suits my own musical work. Further slanting the thirds axis to 60 degrees makes it a hexagonal lattice, and for me the relationships between the notes become more intuitive. The major chord is now, appropriately, a stable-looking triangle. And a new axis appears, northwest to southeast: movement by minor thirds. I follow Mathieu’s example and show this one with a dotted line, because it isn’t a direct move: the minor third is a third down and a fifth up, a compound move on the lattice — a major (sorry) insight into the nature of the minor third. Much more on that one later. 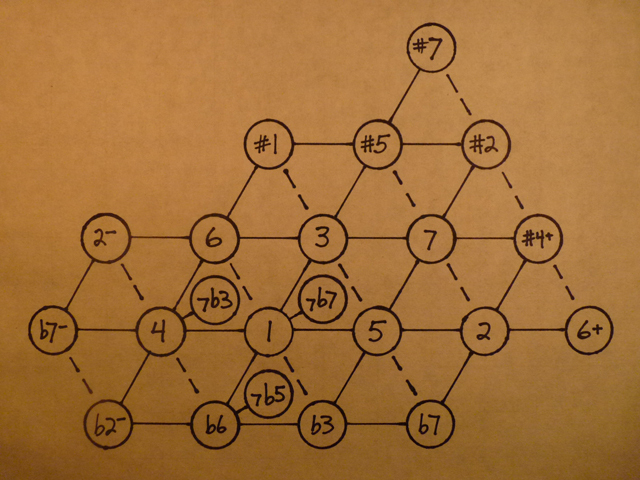 Japanese mathematician Shohé Tanaka drew a hexagonal tone lattice in the 1800’s. I haven’t been able to find a picture. Movement to the right represents multiplication by 3, that is, up a fifth. Up and to the right means you’ve multiplied by 5, up a major third. Left means division by 3, down a fifth. Down left is division by 5, down a major third. The tonic, 1, is at the center (below left of center in this portion). The grid goes out to infinity. This is the region encompassed by Flying Dream, which in fact covers most of the territory I’ve found useful so far, a major reason I chose that song for the video. Hey! This seems interesting, but it is a bit hard to read for me. I wondered if you wanted to take on a challenge. The points are individual notes? Can you map the diatonic scale to ROYGBIV? With appropriate half steps, (Red=C, Orange=D, and so on) Maybe it would be easier to see the relations for me then? Hi Emil, thanks for tuning in. Please have a look at this article on the Major Scale, http://www.garygarrett.me/?p=451 — it should help you visualize the diatonic scale on the lattice. The central portion, 1-2-3-4-5-6-7, is C-D-E-F-G-A-B in the key of C. Following the numbers in order is interesting and beautiful. As an exercise, how about grabbing some colored pencils and drawing a lattice for yourself? Drawing it and coloring it as you suggest might well make it clearer. All the best! Your triangular grid is a rotation of the button layout for the Hohner Harmonetta chordal mouth organ – the idea was you could punch either vertices or centres of the triangles and get either single notes or triads. They were expensive and haven’t been made for about 20 years, but they are still in demand. The Finnish harmonica quartet Svang use one. Wow, cool! I had no idea such an instrument existed. Is there a relationship between the inhale chord and the exhale? You remind me — the first LP I ever bought was Cherry Blossom Pink by Jerry Murad’s Harmonicats. All the best!